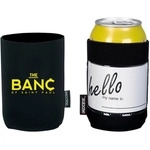 Keep your drinks cool and your promotional campaign even cooler with personalized koozies. These custom can coolers can handle the heat, keeping drinks cold and your logo prominent. They're great to hand out at company picnics, tailgate parties, and outdoor festivals. At ePromos, we have your drinks covered: we let you customize can and water bottle coolers, knit wine glass covers, and coffee cup sleeves. Personalizing your own koozies and drink insulators has never been so easy. Full Color Urban Peak 3-in-1 Custom Insulator/Tumbler - 12 oz. This Full Color Urban Peak 3-in-1 Custom Insulator/Tumbler is the perfect gift for everyone! It works as a can and bottle insulator, as well as a tumbler. Not your ordinary can cooler! Stand out with your next promotional gift with these Puffy Insulated Custom Can Cooler! Trendy and unique, this insulating sleeve keeps beverages cold, and is available in 3 colors. Full Color Folding Slim Custom Can Cooler - 8 oz. Keep your 8 ounce cans cold with this Full Color Folding Slim Custom Can Cooler! Design it to match marketing for your next big event or party. The promotional can cooler insulator that started it all. One of the bestselling promotional products in the world. An open cell foam custom bottle cooler that fits 12 oz. long neck bottles. A Little Buddy custom can cooler with a burlap finish gives your logo or event a nostalgia country feel. A perfect way to add some country charm to outdoor weddings, picnics or family reunions. Football shaped custom can cooler makes an exciting sports promotion! This unique Custom Can Insulator by Koozie has metallic surface for maximum logo reflection! Made of durable PVC, this Beach Bum custom can holder is inflatable allowing your favorite drink to be close-at-hand in the pool. Perfect for meet and greet events, this Koozie Custom Cooler Sleeve w/ Business Card Pocket comes with a 'Hello my name is' card inserted, or simply slide your business card into the 2" x 3.5" window for the perfect trade show giveaway. Fun for your next event, this unique Full Color Slap Wrap Custom Can Cooler is perfect for cans, bottles, glasses, wrists, and more! Made out of high quality wetsuit-like material, these Koozie Custom Cooler Sleeves w/ Handle Strap are sure to be a hit at your next event! The elastic hand strap makes it easier to hold your beverage and prevents spills. Have a blast at parties with this 3-Location Folding Custom Can Cooler which showcase your company brand at 3 different angles. Get the maximum exposure you deserve! Remind your customers that you are not ordinary and stand out from the competition with these Little Buddy custom can coolers. Promote your brand in a whole new way with these amazing Zino knitted bottle custom coolers imprinted with your unique logo. When you want to give a promotional item that represents your brand well and is a product recipients will love to use, then give these Zino knitted wine glass custom coolers imprinted with your logo. Promote your brand or message in a unique and colorful way with these Little Buddy custom can coolers with your full color imprint. These Little Buddy Custom Can Coolers feature a burlap pocket that offers some country charm. Put some color in to your promotional giveaways with these unique Little Buddy custom can coolers with a full color pocket. The Little Buddy burlap covered custom can cooler is the perfect way to add some country charm to your upcoming event. The convenient pocket allows you to carry your ID, business cards or other small items. Make a bold marketing statement and remind your customers that you stand out from the competition with these Little Buddy denim and neoprene custom can coolers imprinted with your logo. Make your next promotion stand out in a crowd with this Metallic Folding Custom Can Cooler! It folds flat so it's easy to store in pockets and purses. These Little Buddy Custom Can Coolers feature a denim pocket that offers some unique trendy style. Perfect for summer giveaways! Keep a secure grip on your cold beverage with this Folding Custom Can Cooler Sleeve! Fun and stylish, this Koozie Color Changing Custom Cooler Sleeve changes color with the heat of your hands! Perfect for summer company outings, trade shows, and more. This Koozie Custom Cooler Sleeve w/ Bottle Opener is perfect for any summer event! Keep drinks colder for longer, and open bottles at the same time. Copper Vacuum Custom Tumbler/Can Insulator Combo - 12 oz. You can keep your favorite cold beverages colder longer with these great freezable custom can coolers imprinted with your logo. Start the conversation with this promotional business card Koozie. An effective conversation starter for company events and fundraisers. This fun Rainbow Folding Custom Can Cooler is a great hand out for your next summer party! It folds flat so it's easy to store in pockets and purses. The Kratos Double Wall Stainless Custom Can Cooler makes your drinks stylish while keeping them colder. An ideal item for vacations, tailgate parties, or an afternoon of enjoyment. Full Color Folding Slim Custom Can Cooler - 12 oz. Fun for your next event, this Full Color Folding Slim Custom Can Cooler holds a 12 ounce can and is made of 1/8" thick high density foam, ensuring beverages stay cool! Koozies are a fun promo item beer and soda drinkers will use every day! Is anything more frustrating than having a drink that gets warm too quickly? A promotional koozie will keep attendees' drinks cool, and your logo fresh in recipients' minds. Gain mass brand exposure at the beach, picnics, outdoor festivals and more! At an attractive price point for bulk purchase, gift these insulators to clients and staff alike! Our huge inventory of promotional insulators ensures we have the style and material you desire. Anticipating a big game day? Get some branded football koozies for your tailgate party. Need to keep coffee warm when it starts to get cold out? Give your employees and clients some nice metal thermoses. The possibilities are endless! Browse our selection of cozy koozies and request a sample or design and order online!